I remember the good, old times – about one or two years ago – when Steve Bromley aka Gnomefoam produced Audacity-crafted mash-ups of experimental proto pop music. Earlier this year he surprised me with the unexpectedly song-oriented Squirrelcore, which I considered a huge improvement. That’s why I didn’t expect not even a year later to get another one of his self-made albums that once again saw an impossible surge in creativity. Insect Armour Plates should have no right to be as great as it turned out to be. Considering that the act of composition and recording took less than a year, this is one hell of a record. I have no idea how much of the music is borrowed from unknown sources and how much the artist performed himself, but what is important is the final result, and that is highly listenable. I won’t go so far as saying that gone are the times of experimentalism, but Gnomefoam nowadays totally masters the art of combining catchy songwriting with crazy sound generation. The overall impression is very lo-fi, not unlike Ariel Pink and his Haunted Graffiti, but there are so many different genres mixed together that half the fun is already discerning the different influences. The main ingredients are alternative hip hop and indie pop (the former comparisons I drew to Why? still make sense), yet there are also the occasional breakbeats, weird electronica, spoken word samples that further the strange yet utterly compelling music. 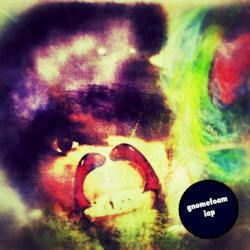 In the past, Gnomefoam’s albums always sounded like an entity, making it hard to point out a highlight. This doesn’t count for Insect Armour Plates any longer though. Nearly every song has something that makes it stand out on its own, starting with the opener Nightswing which starts like a cheesy Eighties influences Alphaville hit before turning into a lo-fi electro pop marvel. The following Date Night’s first half comes with a groovy bass line and a rocking guitar, before its second half displays the artist’s hip hop affinities. DINOZE has an inexplicable Nintendo flair and is a winner already just because of the enchanting synth work. Mixtaper is a long extrapolation of what happens when you mix together hip hop with breakbeats. I could go on like that, but why don’t you just check out the album which can be streamed on Gnomefoam’s Bandcamp page, and even downloaded for the amount of money you choose (even free, but that is if you only want to listen to the music without supporting the artist… although why you would want to do that is hard to understand). The Internet features a lot of artists who offer their music for free, but let’s face it: most of them are not worth your time. Steve Bromley is a laudable exception, and everyone you can imagine to like music that has the lo-fi charm of Ariel Pink combined with the experimentalism of a Max Tundra, plus a dose of over-caffeinated Why?, must check out Gnomefoam’s latest stroke of genius. There is no way you are going to regret it!